Here are some attractive features of the game. Other highlights will be added to keep you excited. 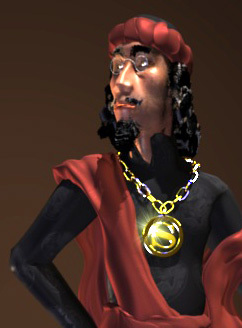 Snoöpos Dogos is a businessman involved in several sectors of Hyade Island’s economic life : real estate, tourism, entertainment, personal loans, etc. He sometimes deals in dentistry when he feels some of his customers might be better off with a teeth reduction (in number). He owns The Colossal, the largest hotel on the island. It’s actually the old Colossus of Rhodes, bought back piece by piece in Turkish bazaars, reconstructed and converted into a luxury hotel. 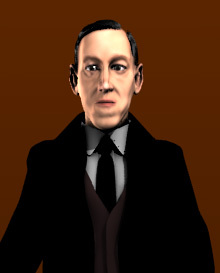 It turns out Edgar’s neighbor, the mysterious poet, is actually none other than the American master of unspeakable cosmic horror : H. P. Lovecraft! He honors us with his first appearance in a video game. Connoisseurs know that when it comes to tentacles, Howard is never far away. You have a romantic soul? You dream of exploring the depths of the Seven Seas? You feel like a walkyrie of the surf? Make the Wagnerian swimsuit your ultimate fashion statement. Made from authentic chain mail, it is both stylish and lyric. This summer, be the center of attraction of the beach and of the seabed! 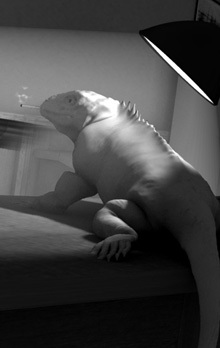 Isaac, iguana-sleuth, has a great role to play in this saga. Will he quit smoking? Will cigarettes lead him to harder drugs? Will he emancipate from Jeannine? 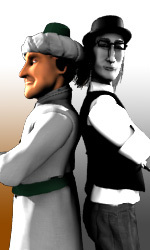 Our two heroes are back: Edgar, the historian P.I. whose naiveté has become legendary, and Abdullah, the Ottoman official whose actions never seem to have any noticeable effects (despite good intentions).